Home > Laptops > Dell Laptop Computers > Dell Latitude 5490 14"
Dell Latitude 5490 14” Laptops is the top level of productivity business laptop solutions for Small to Medium Size Businesses (SMBs) seeking the top tier of security, manageability, and versatility for their end users working on the go or in remote locations! Made for versatility of configuration, the Dell Latitude 5490 laptops can keep you productive no matter the task. Choose from the newest 8th generation Intel Core processors with turbo speeds of up to 4.20 GHz, DDR4-2400 memory upgradable to 32GB, and tons of SATA or solid state drive (SSD) storage options to choose from with our Aventis Systems custom laptop configurations! 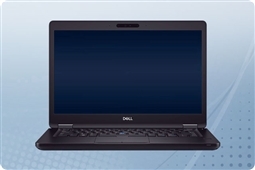 In addition, security and management features are second to none with the Dell Latitude 5490. Feel safe knowing your end user data is protected and managed with ease through features such as Dell ControlVault, multi-factor authentication, Dell Intel vPro extensions for remote deployment and management, and optional Activate Windows Hello for facial recognition and easy access. Plus, with a durable design and all day battery life you can always feel assured knowing that no matter where you are working the Dell Latitude 5490 laptop can keep you productive! Aventis Systems is happy to offer all of our Dell Latitude 5490 14” laptops with a comprehensive 1 Year Essentials parts replacement warranty standard on all models. In addition, more coverage is available for your team through our easy upgrades to Express NBD parts replacement, Extended 2 Year Term, and Secure Drive media retention warranties. So check out our models below and customize the most expandable and essentially secure business laptop for your end users today with the Dell Latitude 5490 14” laptops from Aventis Systems!